The luxury camping site of Le Bois de Valmarie occupies a prime position just a short stroll away from a beautiful sandy beach. Naturally, most people who rent a mobile home at this leading LUX-camp come here to spend their days on the sand and exploring the rest of this part of France. 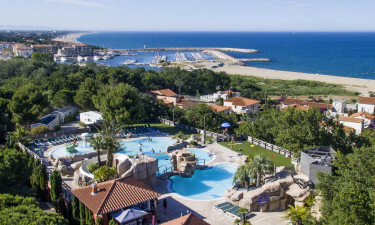 However, the site itself also feature an excellent range of activities for guests to take part in as well as facilities that provide fun and relaxation. What Makes Le Bois de Valmarie So Special? The beach that is situated to the camping site features cool and calm water that is ideal for swimming in as well as practicing a wide range of water sports. A pretty sandy trail leads the way to the beach from the luxury camping site and residents will want to pause only to pack a picnic so that they can spend the whole day spread out on the sand and riding the waves. 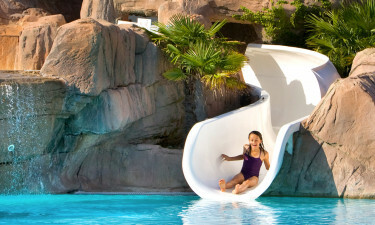 However, guests do not even have to leave the site to spend time messing about in the water as a large heated water park is situated in the very heart of Bois de Valmarie that features several water slides as well as a paddling pool for young children. Special aqua aerobics classes are organised here for people of all ages to enjoy, while guests can also have fun and make new friends by taking part in special water sports contests that are held throughout the summer months. Of course, people who want to do as little as possible during their stay at Bois de Valmarie will also find that they are well catered for. Sun loungers are set beside the pool and these are great places to simply sit and catch a few rays. The dedicated staff from the restaurant are on hand to bring refreshments to guests, which means that they never have to move a muscle, while playing games such as table tennis and volleyball are great ways to unwind and have fun. The restaurant at Bois de Valmarie comes complete with a terrace where guests can sit and soak up stunning ocean views while indulging in a freshly prepared and cooked French meal. The area also features a large and well stocked bar, while the staff at the luxury camping establishment put together a good programme of evening entertainment options that include elements that all the family will enjoy such as magic shows and talent competitions. People who stay at Bois de Valmarie can purchase everything that they need for their camping holiday at the supermarket. This includes freshly baked croissants and bread as well as snacks, local produce and even spare gas bottles and toiletries.